Excerpts from news reports about the troubled investment bank. Apology: We apologise for removing Tan Kin Lian’s piece on “Business ethics” posted earlier today. It will be published at a later date. The following are excerpts from various news report on the latest happenings at US investment bank, Merrill Lynch. Singapore‘s state-linked investment firm Temasek Holdings is its largest shareholder. Temasek agreed in December to invest up to $5 billion for a 10% stake in Merrill Lynch at $48 per share. Since then, more than 50% of the market value of Merrill Lynch has evaporated, to the present level of $25 a share, from more than $55 a share just before the new year. Temasek was savvy enough to have negotiated protection against equity dilution when it concluded the previous deal: under the terms of the agreement, Merrill Lynch must compensate the Singaporean wealth fund if it raises new capital at a lower price in the future. Still, Temasek is still at risk of booking loss if the share price of Merrill Lynch dives further. In yesterday’s statement, Merrill said it agreed to sell $30.6 billion of collateralized debt obligations — the mortgage- related bonds that have caused most of the firm’s losses — for $6.7 billion. The buyer is an affiliate of Lone Star Funds, a Dallas-based investment manager. Merrill has lost almost 55 percent of market value this year. Only Lehman Brothers Holdings Inc. has fallen more on the 11- member Amex Securities Broker/Dealer Index, dropping 77 percent. Merrill fell 12 percent yesterday in New York Stock Exchange composite trading. 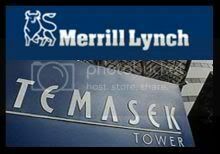 Singapore‘s state-linked investment firm Temasek Holdings, the largest shareholder in troubled US investment bank Merrill Lynch, confirmed on Tuesday it was increasing its stake. Merrill Lynch announced Monday it was dumping billions of dollars of mortgage debt at a steep loss and raising 8.5 billion in new capital, including the 3.4 billion from Temasek. The announcement came after Merrill on July 17 posted a net loss of 4.89 billion dollars for the second quarter. Temasek had already committed in December to injecting 4.4 billion dollars, which it could increase by another 600 million dollars, into Merrill Lynch. That initial investment came with a requirement that if Merrill raised more capital within 12 months at a price lower that the 48 dollars per share that the Singapore fund paid, it would be compensated for the difference. The Singapore firm is putting that 2.5 billion back into Merrill, along with another 900 million dollars. The world’s largest brokerage says the sales will trigger a third-quarter write-down of $5.7 billion, but plans to raise $8.5 billion in new capital through a public offering. Temasek Holdings, Singapore‘s sovereign wealth fund, will purchase $3.4 billion of common stock as part of the deal. The move shook confidence in the banking sector, rekindling fears that the credit crisis that has gripped the world for the past year has more to run. It followed an announcement earlier in the day from Australia‘s ANZ that it would write down more than $1 billion in credit-related losses. Merrill Lynch, the investment banking giant that has lost more than $40bn (£20.1bn) on its mortgage investments since the start of the credit crisis, shocked Wall Street last night with plans to raise $8.5bn in new shares. As part of a sweeping financial restructuring, the company is dumping most of its remaining holdings in risky mortgage derivatives and tapping the Singapore government for an emergency $3.4bn cash infusion. The news of Merrill’s financial restructuring came after a day of mounting rumours it was facing new writedowns, just 11 days after it had posted its last results, containing a bigger-than-expected $9.4bn of writedowns. Its shares sunk 12 per cent to their lowest close in almost 10 years. Temasek will plough that money, plus another $900 million, back into new Merrill stock, potentially increasing the state-run fund’s stake in one of the best-known U.S. banks to more than 10 percent. The fund had been facing huge paper losses on its initial investment in Merrill at $48 per share as banking stocks slid this year amid writedowns on risky debt. The rebate, announced less than two weeks after Merrill posted a $4.9 billion second-quarter loss, effectively reduces the cost of Temasek’s existing shares in the U.S. bank by more than half to $21 a share, according to Reuters calculations. Neither Merrill nor Temasek disclosed the price at which the new Merrill shares would be offered. Witching hour ought to be moved forward from midnight to early evening in New York. These days, the few hours after the market’s official close all too often play host to announcements of profit warnings, bank failures and writedowns. Merrill Lynch added to the Wall Street horror show last night with news of yet another multibillion-dollar writedown and capital-raising effort. Less than a fortnight ago, Merrill sprang another after-hours surprise on investors in the shape of worse-than-expected quarterly results on the back of, you guessed it, big writedowns. Rumours of more bad news had already pummelled Merrill’s stock throughout yesterday – it closed down almost 12 per cent to hit its lowest level this decade. When the quarterly results were announced, the hopeful explanation was that John Thain, chief executive since December, was ripping out the kitchen sink with gusto. In saying Merrill will take a third quarter charge of $5.7bn and needs to raise another $8.5bn – about a third of the current market capitalisation – Mr Thain has confirmed that rotten plumbing still needs to come out. Tellingly, Merrill is selling collateralised debt obligations with a gross value of $30.6bn at 22 cents on the dollar. What’s more, Merrill is providing financing for the buyer, Lone Star Funds, for three-quarters of the purchase price – with the funding secured solely aginst the heavily discounted assets that the fund is buying. In effect, the money Lone Star is putting up itself to take the portfolio off Merrill’s books equates to just over 5 cents on the dollar of the gross value. Mr Thain continues his job of scrubbing Merrill’s toxic balance sheet. He has even managed to persuade Temasek Holdings to come in again on the latest capital-raising, albeit at heavy cost. The problem is, like most horror franchises, the sequels to Merrill’s original chiller appear to be never ending.